I Have 1,000 Twitter Followers. How Did That Happen? 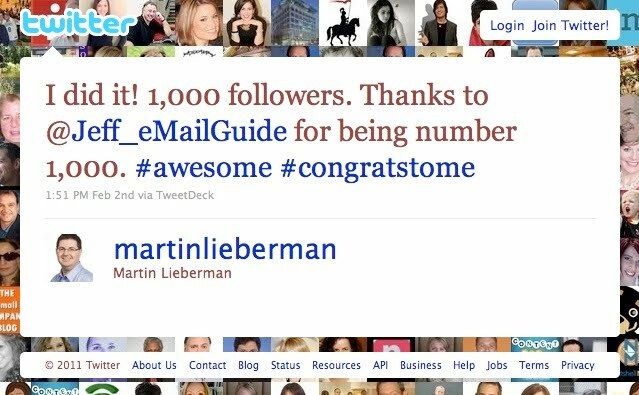 Last week, I reached what I consider to be an impressive milestone: the 1,000th person decided to follow me on Twitter. Who’da thunk it when I first joined Twitter that I’d be so into it, that I’d stick with it this long, and that I’d ever reach this auspicious milestone. My followers did, and they kept flocking to me one after another. Now I’ve tweeted more than 8,220 times and yes, I have more than 1,000 followers. When Jeff Ginsberg clicked the Follow button on Wednesday, he did more than add to my list; he validated that I’m doing something right here. I’ve made no secret of my love of Twitter and I continue to believe that if you don’t like it, then you must not be using it. Like, really using it. Not just listening and staying on the sidelines. Twitter is good for much more than wasting time. It’s good for learning new things, meeting new people and building relationships, and yes, getting free ice cream. Perhaps that’s why, in the past year, a number of people have asked me to teach them about the site, how to use it, and how to grow their presence. You can’t expect to get followers if you hardly ever tweet, and you can’t expect to be taken seriously on social media if you don’t tweet often. I tweet daily, and many, many times during the day. Actually, for a long time now, I’ve been tweeting every 15 or 30 minutes (a tactic I borrowed from Guy Kawasaki, who tweets about that often from his personal and his Alltop handles). That way, whenever people check their feed, they’ll see a tweet or two from me. And I use HootSuite so I can pre-schedule those tweets and don’t have to be sitting at the computer all day. (Note: I’m not saying you have to tweet as often as I do. I’m sure what I do is excessive.) In addition, over the past year I’ve been to more than a half dozen conferences, and I’ve live-tweeted all of them, giving my followers the chance to attend vicariously through me. I may tweet often, but I don’t post everything. Instead, I share the articles and content I find interesting and worthwhile — stuff I think my followers will benefit from reading too. People who follow me and who share my interests can count on me to keep them informed. They don’t have to follow multiple people because they know I’ll tell them what they need to know. 5. Screw the lines. Share what you want. There’s a lot that’s been written about keeping your personal and professional lives separate on social media. In some cases, that’s good advice. But if you’re tweeting for yourself and not for a corporate handle, then there’s no need to stick to one subject matter. My tweets are about marketing, social media, email, TV shows, movies, sports, things that annoy me, restaurants I enjoy, and more. If it’s true that people buy from people, and not from businesses, then simply being yourself will help you to forge connections with other people. I mentioned that I’ve been to a bunch of conferences this past year. That’s just one way I’ve met people and started relationships. Other people I’ve simply replied to and started relationships that way. I don’t know all of my followers and I don’t know all of the people I follow, but I’ve used Twitter to get to know many of them. Now, when I see people I follow offline, there’s already a basis for a relationship that we can continue IRL (in real life). No wonder I enjoy going to conferences now. Speaking of which, if someone retweets something you’ve posted or includes you in a Follow Friday roundup, or replies to something you tweet, write back, and be sure to use that person’s handle. Say thanks, or encourage people to follow this person, or retweet something that this person has posted. It’ll show the person you’re for real and will encourage future sharing. 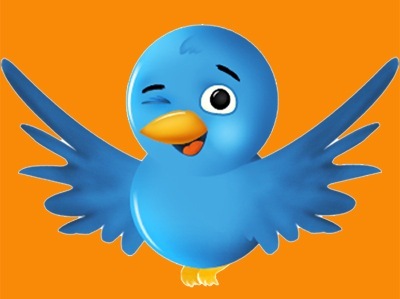 And for the record, even though I pre-schedule many of my tweets, I’m always checking to make sure I haven’t missed a reply or a retweet, so I can reply if needed. 8. Let your followers bring you more followers. Building relationships with people on Twitter has allowed me to get exposure to my followers’ followers. When someone who follows me retweets something I’ve posted, or mentions me in a tweet, then that person’s followers see me and often follow me as well. The endorsement of my followers means a lot. 9. Get in the mix. Is there a hot topic you’re interested in? Tweet away, and use the appropriate hashtags. For example, I was tweeting during the Lost finale and the Super Bowl last night, during various awards shows and other sporting events, and other peak times for Twitter activity. People saw my handle, enjoyed my comments, and clicked Follow as a result. I didn’t try to get more followers. In fact, when I first started using the site, I blocked some people because I thought, “Why would they ever want to follow me?” The thing is, if you put enough good content out there, and you just be yourself, then people will find you, like they’ve done with me. I’m not saying these tips are the 10 right ways to build a Twitter following, and I’m not saying they’ll work for everyone. I’m just saying that’s this is what’s worked for me. Really, there are no social media experts yet, and anyone who tells you otherwise is full of it. The best advice anyone should give is simply to get on Twitter and just use it. No one knows exactly how to use it, so you need to find out for yourself. 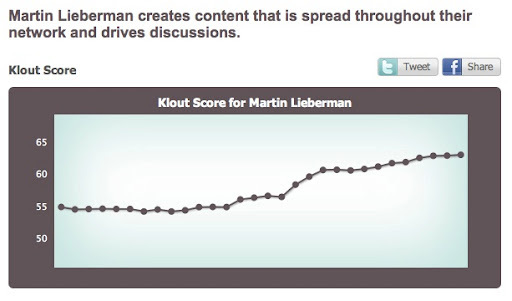 Point is: I’ve got 1,000 followers and a Klout score of 63, and those numbers keep on growing. So I must know a little something about what I’m talking about.